After configuring a Dual Stacked DHCP server and DHCPv6 on Juniper SRX, it’s only right that I did something on Configuring DCHPv4 on a Juniper SRX. This wont be a long or detailed post, as the configuration is very much the same as my previous post on how to configure DHCPv6 on a SRX, and I’ve went thought quite a lot before about how DHCP works etc. Next, under the access address-assignment stanza, you will need to set the network, the DHCP range and set the IP address that the router will be using within the DCHP pool. The propagate-settings will take configuration from the client DHCP on vlan.3407, if not otherwise specified, most importantly name-server which changes from ISP to ISP and is very important otherwise name resolutions on the LAN won’t work. [email protected]> show dhcp ? In a previous post I wrote about how I went about configuring a NTP server and setting NTP clients. A few days later, when speaking with my senior, the plan changed slightly and we weren’t configuring our own NTP server using Linux based OS, but get satellite feeds running our own LANTIME Stratum 1 Server o_O! In other words that previous post is now invalid haha! For now I don’t know if I’ll be involved in that side of the project, I hope I am, but that’s for another day! Back to my actual point, because of the environment we run in our datacentres, our firewalls run with Virtual-Router Routing-Instances. A Virtual Router is similar than Cisco’s VRF concept however, with Juniper’s a Virtual Router is used for non-VPN related applications. So, I was asked to investigate if it was possible for our firewalls to be NTP clients to a NTP server via the master instance and also be able to act as a NTP server to attached clients within a routing-instance. 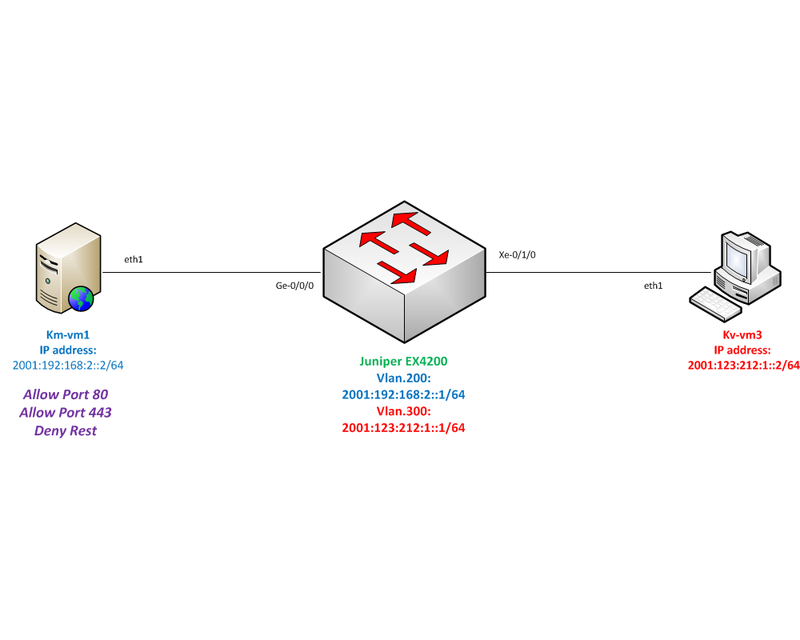 As the diagram shows, I’ll be using a standalone Juniper SRX220h and two ESXi Ubuntu 14.04LTS servers. The SRX will be a NTP client of the NTP server (km-vm4) via the master inet.0 table. The second client km-vm1 will be located within the Routing-Instance “test” and will be using the SRX220 as its NTP server. Security policies will need to be defined, as the stateful functionalities of the SRX will still be in use. Without creating security between the zones all traffic will be dropped. With this setup, the overall goal of this testing is to see if it’s possible to advertise specific routes from the inet.0 table to another routing table, to allow end to end connectivity between routing instances. boot-server: When the router or switch boots, it immediately synchronizes with the boot server even if the NTP process is explicitly disabled or if the time difference between the client and the boot server exceeds the threshold value of 1000 seconds. source-address: This is statement useful for controlling which source address NTP will use to access your network when it is either responding to an NTP client request from your network or when it itself is sending NTP requests to your network. As described above, and in a nutshell, by adding the source-address this will allow other clients/devices to set an IP address that’s located on the SRX as their remote NTP server. Thus providing a /32 address that can be advertised. For my example the address 192.168.2.1, the gateway address for the ntp server, will be the address used as the source address. We can verify the NTP association by using the command show ntp assocication. To get the route installed into the test.inet.0 table, we’ll need to leak the 192.168.2.1/32 route into the test.inet.0 table, and we’ll do this by creating two policy statements. For my example I’ve named them master and instance just for ease! Master: This statement allows all routes from routing instance test to be accepted into the master routing table. Instance: This statement has two terms. Term 1 only allows the exact route 192.168.2.1/32 from the master instance to be accepted. Term 2 denies all other routes from master instance. Now we’ll need to import the relevant policy into each instance, under the routing-options stanza for the inet.0 table and routing-instance test routing-options for the test.inet.0 table. Having committed the policy statements, when we check both routing tables we can see the 192.168.1.0/24 route have been leaked into the inet.0 table, and that only the 192.168.2.1/32 route has been installed into the test.inet.0 table. All other routes have not been leaked. Once that route has been installed we can see that the host has now become a NTP client to the SRX by running the command ntpq -p. In addition on the SRX, we can see the flow session between inet.0 and test.inet.0 routing tables. From my research and testing, I’ve notice there are a few ways you can set IPv6 addresses to hosts. Essentially you have 3 methods; manually setting a Static IP address, Using Stateful Dynamic Address allocation via a DHCPv6 server, or by using Stateless Dynamic Address allocation. The first two methods are pretty standard as addressing with IPv4 is done this way however, the last method is new method that comes with IPv6 and this is actually known as Stateless Address Autoconfiguration (SLAAC). SLAAC, as its name suggestions, allows a host to auto configure itself without any manual intervention. The IPv6 stateless autoconfiguration mechanism requires no manual configuration of hosts, minimal (if any) configuration of routers, and no additional servers. The stateless mechanism allows a host to generate its own addresses using a combination of locally available information and information advertised by routers. Routers advertise prefixes that identify the subnet(s) associated with a link, while hosts generate an “interface identifier” that uniquely identifies an interface on a subnet. An address is formed by combining the two. In the absence of routers, a host can only generate link-local addresses. However, link-local addresses are sufficient for allowing communication among nodes attached to the same link. In essence, when using SLAAC to get the full 128-bit IPv6 address, it uses the 64-bit prefix that is advertised by the host or router for the first half, then in conjunction with the EUI-64 process, is able to allocation the second 64-bit of the address. Enabling SLAAC with Junos is pretty straightforward. For my example, I’ve got an EX4200 connected to an Ubuntu 14.04LTS ESXi host in Vlan 200. Once that’s done, to make sure no address was learnt as I configured the switch, the interface was disabled using ifdown. With the switch configuration, under the protocol router-advertisement stanza, the interface and the prefix (first 64-bits) that will be advertised need to be set. Additionally I enabled a traceoption to see the process from the switch’s perspective. Now, back on the host, I re-enabled the interface using ifup. By using ifconfig we can see that the IPv6 address has been auto configured onto the host. On the switch, by running the commands: show ipv6 neighbours, we can see the hosts’ link-local and SLAAC allocated addresses, both discovered by the Neighbour Discovery Protocol (NDP). And show ipv6 router-advertisement, which shows how many RA’s and RS’ have been sent and received by the switch. When we look further at the traceoption, we can see the request from the host sent out Router Solicitation (RS) via its link-local address, to the destination of ff02::2 for the presence of routers (in this case a switch) on the link. The switch replies by sending a Router Advertisement (RA) to ff02::1 with the Router’s presence and link prefixes, MTU, and hop limits. The ff02::1 and ff02::2 addresses are well-known IPv6 Multicast addresses that a host sends out to a RS, to all devices within the all-host multicast group for ff02::2, and for a router, the address ff02::1 is used to reply RS with RA. Although this process could be compared to the IPv4 broadcast address 255.255.255.255, its important to remember that broadcasts are not accepted by any IPv6 protocol. SLAAC is a really useful way of easily enabling IPv6 across your network and let the host and devices auto configure themselves. In addition, as the EUI-64 process is key to SLAAC, as long as you keep a record of the MAC Addresses of each device, you’ll always be able to know what address goes with what device. Of course, there will be situations where Static or DHCP addressing will be more suitable however; if you need to quickly enable your network with IPv6 then SLAAC is the way to go! With the Christmas season coming up, changes and the current course of projection slow down, so this is the perfect time to start messing around in the lab with things I wouldn’t normally get the chance to do. One thing I know will be happening in the future (but not the near future) on my work network is IPv6. We run IPv6 in the Internet Core however, it’s not to be seen anywhere else on the network, and I’ve heard they’re pushing hard to get IPv6 into our hosting datacentres. With this in mind, and having time to kill, it would be good to be proactive and start looking at how IPv6 and Junos work together! The VRRP router controlling the IPv4 or IPv6 address(es) associated with a virtual router is called the Master, and it forwards packets sent to these IPv4 or IPv6 addresses. VRRP Master routers are configured with virtual IPv4 or IPv6 addresses, and VRRP Backup routers infer the address family of the virtual addresses being carried based on the transport protocol. Within a VRRP router, the virtual routers in each of the IPv4 and IPv6 address families are a domain unto themselves and do not overlap. The election process provides dynamic failover in the forwarding responsibility should the Master become unavailable. For IPv4, the advantage gained from using VRRP is a higher-availability default path without requiring configuration of dynamic routing or router discovery protocols on every end-host. For IPv6, the advantage gained from using VRRP for IPv6 is a quicker switchover to Backup routers than can be obtained with standard IPv6 Neighbor Discovery mechanisms. 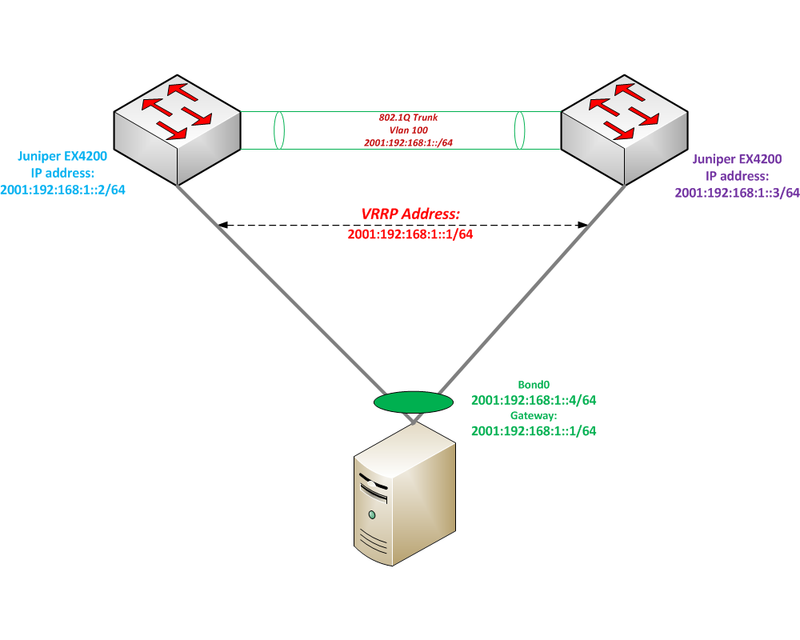 For this test, I’ll have a similar topology as my other VRRP post, but I’ll be using 2x Juniper EX4200 switches and I’ll have ESXi Ubuntu 14.04LTS host configured with active-backup bond; the 2 physical NICs were connected into each switch. Firstly will need to enable VRRPv3. By default VRRPv3 isn’t enabled and VRRPv2 doesn’t support inet6, you will need to have this enabled and is done under protocol vrrp stanza. In addition, as IPv6 doesn’t use Address Resolution Protocol (ARP) for Link Layer Discovery, we need to enable the IPv6 version of ARP, Neighbor Discovery Protocol (NDP). This will allow Neighbor Discoveries (ND) to be sent out to Host and other Network devices with that subnet with are needed to VRRPv3 to work affectively. ND is set under protocol router-advertisement stanza, and the logical interface set. Just like with VRRPv2 you will need to set the entire configuration under the interface stanza whether you have vlan or on physical interface. It is very important to note that you will need to manually set the link-local address on the interface and set a virtual link-local address (these both will need to in the same subnet) without these you will not be able to commit the configuration. Depending on the level of detail you want to go into, you can run any of these commands show vrrp summary, show vrrp detail or show vrrp extensive. I checked both the Master and Backup to make sure everything was expected and differences between the two, by using show vvrp detail. Before testing the VRRP fail over, I enabled VRRP traceoptions on the master and backup, so that we will be able to see what’s happening under the bonnet. I found the logs from the backup were much simpler to understand compared to master however, on the master you were able to see what the VRRP daemon goes through the process of gaining mastership. For the failover, the link down to the host and trunk link on the master were deactivated and from the logs on the VRRP Backup, we can see that VRRP daemon had received the vrrpd_process_ppmd_packet notifying that the VRRP master adjacency had gone down and then received another update ppmd_vrrp_delete_adj to remove the link-local address of the VRRP master and transition to become the VRRP Master. When preempt has been configured on the Master, the two interfaces were reactivated, and it automatically takes over as VRRP Master. As we can see from the logs on the original backup switch, another vrrpd_process_ppmd_packet notification was received by the switch and the switch automatically transitions back to become VRRP Backup. From the host point of view, I had a rolling ping going to gateway during the failover testing and the results were as expected. Although you see packet loss, this is normal due to the bond type (active-backup) and one of the two NICs was unavailable. In addition, the connectivity never completely dropped out and having a host running on 50% capacity is better than a host with no accessibility. The full logs and ping6 outputs are available here: vrrp.master.log, vrrp.backup.log, ping6.